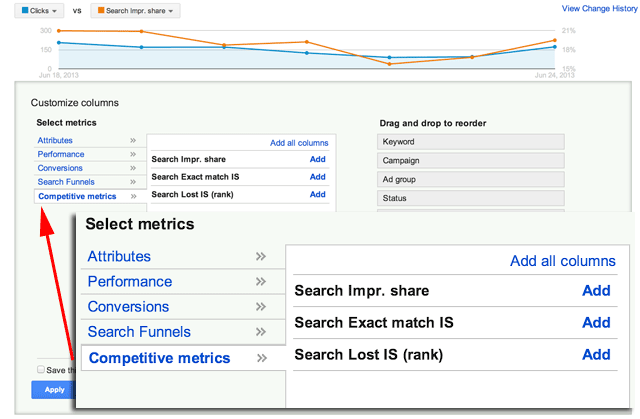 Google announced on Google+ improvements to the impression share reporting section of the AdWords reporting tools. Google has added a new competitive metrics area that adds keyword level customized columns including search impression share, search exact match impression share and search lost IS (rank). Search exact match impression share: The impressions on exact match keywords you’ve received on the Search Network divided by the estimated number of impressions you were eligible to receive. Search Lost IS (rank): The percentage of time that your ads weren't shown on the Search Network due to poor Ad Rank. Note: Lost IS (rank) won't be shown on your Keywords tab if you ran out of budget at any point during the date range being examined. For more details, see this help document.